Wooden Arkansas state shape cutout for crafting projects. Perfect for painting white with red chevron stripes for die hard sports fans. 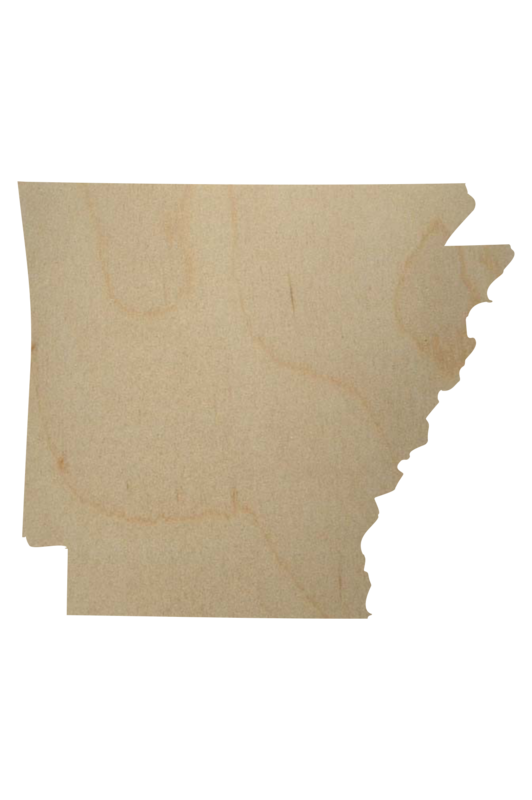 Show your Arkansan pride with this wooden cutout of Arkansas. We offer this Arkansas state wood shape in 1″ up to 36″ dimensions. Being slightly wider than tall, the dimension is based on the width. We have a variety of thicknesses available to order from 1/8″ up to 1″ thick to fit your project needs. Looking for a guestbook idea? This would be perfect for Arkansans getting married. Painted white and use a gold marker for a unique look. This would also be great to use for a chalkboard in the kitchen. The ideas are almost endless! You can use almost any paint on the state wood shapes. We use house paint, craft paint and stains.